For sufferers of traction alopecia, the key to curing it begins with changing hairstyling methods. 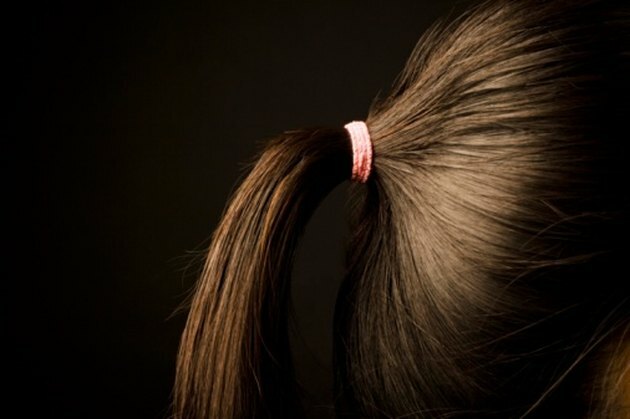 Pulling hair tightly into ponytails or braided hairstyles may trigger permanent hair loss. Dermatologist Dr. Jeffrey Benabio says traction alopecia causes scarring of the hair follicle. Hair lost from permanently scarred follicles will not regrow. Treatment for permanent hair loss includes hair transplants or flap surgery. For follicles with damage but not permanent scarring, over-the-counter medications or injections may help regrow hair. If you notice hair loss, immediately stop styling your hair in tight hair styles. Traction alopecia normally begins on the scalp where hair is pulled the tightest. Damaged follicles do not regenerate. Accumulation of damaged follicles leads to noticeable hair loss. Ditch the braids and ponytails. Use a bobby pin to secure your hair. Bobby pins exert less tension on the hairline. Employ prevention as your first treatment against traction alopecia. Typically over-the-counter medications provide little relief for traction alopecia. In "Hair Growth and Disorders," Ulrike Blume-Peytavi reports 2 percent minoxidil exhibits some promise with application over the course of three months. Areas of the scalp with early stage traction alopecia possess numerous telogen hairs. If diagnosed early, antibiotics and intralesional corticosteriods may induce regrowth. Both require administration or prescription from a physician. Presence of follicles without vellus hairs marks the end stages of traction alopecia. At this point, medication induces little or no regrowth. For people with permanent follicle scarring, surgical hair transplantation or flap surgery provides the greatest benefit, notes Dr. Heather Woolery-Lloyd in the journal "Skin & Aging." In flap procedures, surgeons attach healthy scalp to the affected area. The International Society of Hair Restoration Surgery suggests using flap procedures as an option but not first choice. Explore all available treatments before undergoing flap surgery. After flap surgery, hair at the perimeter of the flap may lack hair. Use hair transplants to fill in gaps left from flap surgery or as a first-choice option. During hair transplants, physicians remove hair follicles from the back of the head to the balding area. Hair transplants will fill out the bald areas. However, pre-alopecia level hair density will not return. What Are the Treatments for Thinning Hair in Black Women? What Are the Treatments for Scarring Alopecia?